The four most critical factors for you to consider in selecting the best Christian Marriage Counselor for you are: (1) Does the counselor actually profess to be a Christian himself or herself, (2) Does she/he have sufficient training, experience, and qualifications in Christian counseling? (3) Does the counselor have specific experience working with similar kinds situations, problems and issues you are facing in your marriage? (4) Does the counselor counsel from a Christian perspective that is biblically sound. Simply saying that one is a Christian counselor because she or he offers advice at their local church, or are a member of the clergy, does not mean that they uphold Christian values and methodology in practice. Many counseling firms offer the services of Licensed Professional Counselors; however, even these credentials, if not combined with a practicing faith in Christ, and a commitment to biblical Christian values, can leave couples needing effective Christian counseling at a loss. It is important when looking for a Christian marriage counselor that the professional be qualified to counsel and have the faith necessary to offer biblical solutions to the seemingly insurmountable problems that married couples face today. Is the experience and credentials of the counselors adequate to meet your needs? Does the counselor have any affiliations or professional endorsements from accredited Christian associations? Does the counselor hold degrees from accredited Christian universities? Does the counselor involved have substantial experience related to your specific needs? Does the counselor have good standing within his/her local church? Is the counselor happily married? Is the counseling firm reputable? Does the counselor have adequate experience working with couples facing a crisis in their marriages? Does the counselor have proven track-record of “success” with married couples? Is the counselor recognized as an authority in their field by other professionals? Does the counselor frequent public speaking engagements on the issues of marital issues and Christian marriage counseling? Has the counselor authored any books or publications supporting Christian marriage counseling? 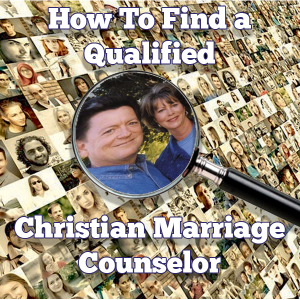 While these are not exhaustive questions they should be helpful to you in your pursuit of finding a qualified, best Christian marriage counselor professional for you. Of these questions, perhaps the most important thing to consider is whether or not the counselor you are interviewing has a like faith. Many people who claim to be Christian marriage counselors are not necessarily even Christians. There are some who practice counseling and have a purely academic knowledge of the Bible, yet do not practice their faith. They might report to offer Christian Marriage Counseling services and still not have a personal relationship with God, our Creator, the One who designed man and marriage, the Author of the Bible. For this reason it is essential that when a person is seeking a legitimate Christian marriage counseling service that they ask questions regarding the counselors’ faith, church affiliation and involvement. God’s Word is sufficient to address the real life issues we face today. God’s Word is sufficient, necessary, and relevant to equip God’s people to address the complex issues of life in a broken world. Your Christian Counselor should have a working knowledge of the scriptures, principles and directives of God as recorded in the Scriptures. He or she may also incorporate any truths they’ve acquired hrough their Christian t training which may be helpful and useful to you or your family by way of therapeutic intervention. All truth is God’s truth, and although modern psychological concepts and interventions are considered theoretical in nature, we know as a fact that Scripture is inerrant and is profitable for correction and instruction. These important tools, all of them, in the hands of an experienced Christian Counselor or therapist can be used of God to meet the needs of any person like yourself that is actively seeking guidance and wisdom regarding personal and marital issues. The best Christian counselor is committed to providing distinctively Christian Counseling. Experience has shown that when a client and his or her Christian Counselor earnestly seeks God’s wisdom that the counselor is equipped to provide sound biblical counsel for you and your situation and that if you are willing to receive and follow God’s wisdom, that the counselor will be equipped to provide you with the best understanding, and insights to most effectively deal with your marital issues. Many Christian marriage counselors will offer valuable resource through their website where you .can find puseful articles ranging from practical marriage advice to Christian marriage living. Cornerstone Marriage & Family Ministries offers Intensive Christian Marriage Counseling Retreats. Stay current with the latest articles and updates on their Facebook Page. You can also find reputable counselors in your area through the American Association of Christian Counselors which offers valuable resources as well. For more information on these resources and more, please feel free to contact Roy Milam of Cornerstone Marriage and Family Ministries.